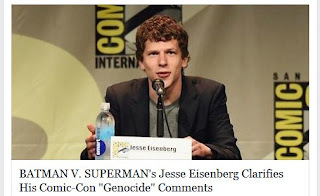 After Jess Eisenberg's Comic-Con / genocide comment, his agents probably started spinning up immediately after the very first sentence in his Batman v Superman panel was finished and we knew this was coming. In fact, so far, Eisenberg has made three separate excuses... I'm sorry, clarifications about his statement about his Comic-Con experience statement. 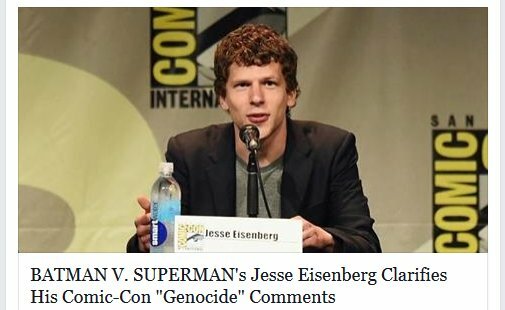 To recap, Jesse Eisenberg (JE... because I'm tired of typing this asses name) stated that his experience at Comic-Con and being screamed at by all the Comic-Con (SDCC) fans akin to "... some kind of genocide." Talk about insensitive, on many levels. If you watch the video at the bottom of this piece from the Batman v Superman SDCC panel, you can see he sits stone still, suffering through the event, and only chimes in when asked something directly. (Unlike his animated peers) Plus his answer is the perfect, Hollywood answer, covering his bases with his peers in the industry. At least that's how it looked to me. Today, JE has explained that "even if they're saying nice things, just being shouted at by thousands of people, it's horrifying," and later said that he was using hyperbole. hy·per·bo·le (noun): Exaggerated statements or claims not meant to be taken literally. Ah... OK, because everyone who is a huge SDCC fan would totally understand that. Well of course you were! Duh, silly us. Us being the entire world of fans of Batman, Superman or SDCC! And for a minute I was thinking this was some kind of experienced actor who might have encountered a fan or two over the past 16 years of his acting career and was used to a little over-the-top enthusiasm. For me I think I'm done with the man. I'm committed to seeing the DC Universe movies, and so be it. JE will make his millions as his character will more than likely continue to appear in films with Superman in it. Unless of course, director Zack Snyder does what Shane Black did to Iron Man's most iconic enemy, and makes Lex Luthor an out of work actor. But I do not believe his explanation... which in and of itself is also, probably hyperbole! HA! I used my new word today! 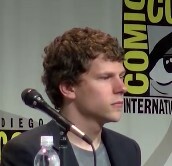 Jesse Eisenberg grew up in New Jersey. His mother was a professional clown (no, really!) and his father was a college professor. He attended the New School University in New York, where he majored in liberal arts with a focus on Democracy and Cultural Pluralism. For a second I was trying to find out how JE got so jaded about the world and the people in it but there's nothing there. He just is who he is.